Interlinking ceramic cups with spouts that allow tea to flow from one to the other are on display in The Changing Room, a former changing space at Dezeen Super Store. Small corks can be inserted into the spouts to stem the flow of tea once the cups are full. 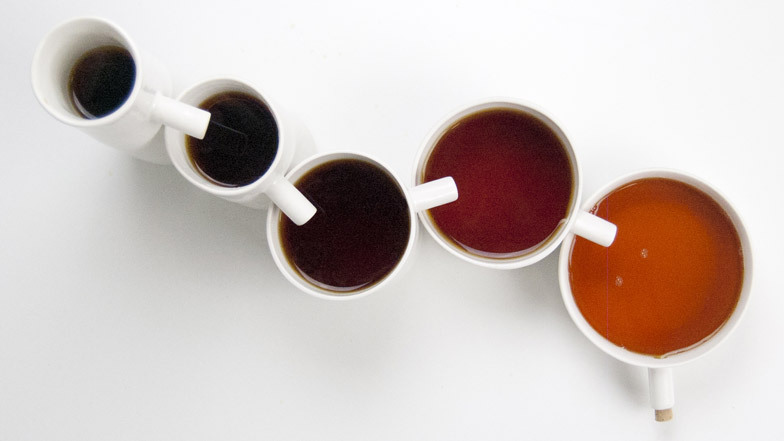 The tall thin cup at the start of the chain holds the same amount of tea as the short, wide one at the end. Fionn Tynan O'Mahony presented the project at the Edinburgh College of Art degree show, and these sets are some of the first produced commercially. Dezeen first saw the cups at the New Designers graduate exhibition in London earlier this summer. They are available to purchase at the store and each set of five cups costs £250.